The Dividist Papers: Gaming the California Republican Primary - A modest suggestion for Democrats in the San Francisco Bay Area. Gaming the California Republican Primary - A modest suggestion for Democrats in the San Francisco Bay Area. Meet Emanuel Lasker, world chess champion at the turn of the 19th century. Contemporary chess grand-masters believed Lasker made moves to intentionally complicate the board without a specific plan of attack, but instead to confuse his opponent and increasing the likelihood of his opponent making a mistake. Some of his opponents (like Richard Reti) even believed he would deliberately make bad moves to psychologically undermine an opponent's play. Lasker reigned as champion for 27 years, the longest tenure of any recognized world chess champion in history. A few Democrats in three congressional districts in California have an opportunity to make a Lasker move, complicate the political chess board, and deal a psychological blow to Republicans that will have ramifications through the GOP convention and into the general election. As few as 18,000 San Francisco Bay Area Democrats could nullify over half a million Duncan Hunter, Brian Billbray, and Orange County Southern California registered Republicans at the Republican convention. Now wouldn't that be fun? The tactic would require about 2% of registered Democrats in California Congressional districts 8, 9 and 13 (San Francisco, Oakland, Silicon Valley) to re-register as Republicans by Tuesday January 22 (tomorrow) and vote for Ron Paul in the primary (about 6,000 voters per district). "... Paul compounds these ills in the one area in which he departs from the libertarians: he doesn't support federal abortion rights. He's been associated with some statements that are racially insensitive (to say the least). He clearly shouldn't be president. But he won't — Paul isn't going to win the nomination. So it's worthwhile endorsing him as a protest vote for two reasons. His presence on the ballot serves to show up ...some of the hypocrisies of the rest of the GOP field — and he is absolutely correct and insightful on one of the most important issues of the day: the war. Paul is alone among the Republican candidates for president in sounding the alarm that our country is pursuing a dangerous, shortsighted, hypocritical, expensive, and ultimately doomed strategy of trying to dominate the world militarily. He opposed the invasion of Iraq and thinks the US should pull out immediately. It's immensely valuable to have someone like that in the GOP debates, speaking to the conservative half of our country about why this policy violates the principles they claim to hold dear. Paul is absolutely correct that if we stopped trying to police the world, ended the war on drugs, and quit negotiating trade deals that favor multinational corporations over American families and workers, we would be a far more free and prosperous nation." This chart shows the Republican, Democratic, and Libertarian vote count in California Districts 8,9, and 13 in the 2006 mid-terms (numbers linked to Wikipedia source for chart data). Midterms and primaries tend to get similar participation from registered voters (about 50%), so this is a reasonable proxy for the vote count we can expect in the February 5th primary. My assumption is that with four or five Republicans still in the primary, it will only require about 35% of the total Republican vote to secure the delegates for Paul. Further assuming that Paul will get the same 6% of the combined Republican/Libertarian vote we've seen in other competitive primaries, we can calculate how many Democratic votes it would take to throw those delegates to Paul. One reason, is that 18,000 Dems could send as many delegates to the Republican convention as Red Orange County district 48, Duncan Hunters Imperial Valley district 52, and Brian Billbray's North San Diego district 50, representing over 600,000 registered Republicans. "... because the more Republican candidates we have fighting it out, trashing each other with negative ads and spending tons of money, the better it is for us... So why are we doing this? Because we can. Because it'll be fun. And because we've suffered Republican meddling, stealing, and disenfranchisement in our elections for far too long." "We want an unsettled field with Republicans fragmented and fighting. We want the theocons (Huckabee), the neocons (McCain), and the corportate cons (Romney) to maintain viable top-tier candidates in the race for as long as possible, since it fuels their civil war. Heck, if we truly hit the jackpot, we might even get a brokered GOP convention. To summarize, this isn't a vote for Romney. It's a vote for "clusterf*ck." Throwing these 9 California Republican delegates to Paul will increase the odds of a brokered convention, and ensure entertaining and amusing television at the Republican convention. Nothing will throw more confusion into a brokered Republican convention than Ron Paul with a basket of delegates. It would take less than 2% of the Registered Democrats in those districts (3%-5% of actual voters) to make it happen. 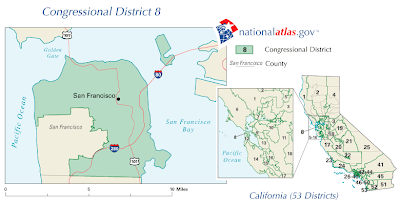 BTW, a similar dynamic exists in other Bay Area districts 6,12,14, 15 and 16 but would require closer to 10,000 or 10% of the voting Democrats (5% of the Registered Democrats) to vote for Paul. Adding those districts would produce 24 delegates total. Now, if you are a Democrat in one of those districts and a believer that Obama, Clinton, Edwards or Kucinich is the only candidate that should lead the Democratic party, then by all means, vote your heart and your party. 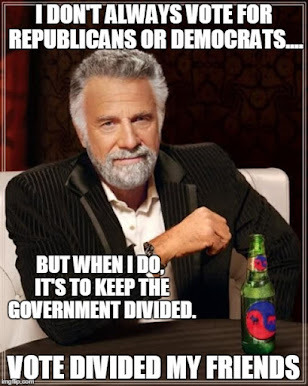 But if you, like many Democrats, think that any of leading Democratic candidates will make a fine President, your vote will go a great deal further to making that happen, by voting as a Republican for Ron Paul in the California primary in those districts. You can always become a Democrat again immediately after the primary. I won't tell. In any case, I can assure you that Barack Obama is going to win the Democratic primary in those three districts whether you vote or not. Trust me on this. I was a registered Democrat for 25 years before registering Republican to vote for Paul in the primary. 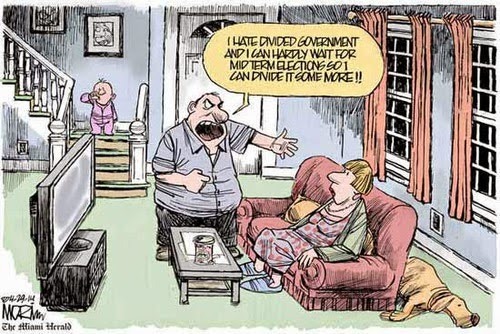 Readers of this blog know of my fondness for divided government. Problem being, I no longer believe that any leading Republican candidate can beat any leading Democratic candidate in November. The Republican party is in the process of ripping itself apart. The only slim chance to head off single party control, may be to help accelerate the Republican Party self-immolation, by throwing some gasoline on the fire and getting behind whatever emerges from the ashes. Technorati tags: Democratic, Republican, Ron Paul, libertarian, California, primary, 2008 Election.